Lubnan is probably derived from the Aramaic laban (as white as milk), because of its snow-clad mountains. 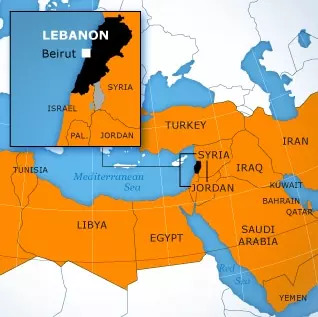 Lebanon is located on the eastern shore of the Mediterranean Sea. The country borders the Mediterranean Sea in the west, Syria in the north and east, and Israel in the south. Its surface is officially 10,400 square kilometres; small parts of the border territories are contested. From north to south, Lebanon totals 215 kilometres; from east to west, at its widest, it extends across 89 kilometres. The coastline is 225 kilometres long, Lebanon’s land boundaries total 454 kilometres: 375 kilometres with Syria and 79 kilometres with Israel. The climate is Mediterranean: mild to cool, with wet winters and hot, dry summers. The Lebanese Mountains can experience heavy winter snowfall. The highest peaks are covered with snow six months a year (hence the name). Lebanon was the heartland of historical Canaan, situated along the Eastern Mediterranean Coast. It was later called Phoenicia by the ancient Greeks. The Phoenician ports of Tyre (Sur), Sidon (Saida) and Byblos were important centres of trade and culture in the 1st millennium BCE. However, it was not until 1920 that the current state was founded. Throughout the centuries, partly due to its rugged mountainous geography, Lebanon has been known for its role as a safe haven for persecuted minorities. From the 7th century CE onward, Christians fleeing persecution elsewhere in the region found a refuge in northern Lebanon, where they founded the Maronite Church. In the 11th century, religious refugees from Egypt introduced the Druze faith. Meanwhile, Arab tribes settled in southern Lebanon.